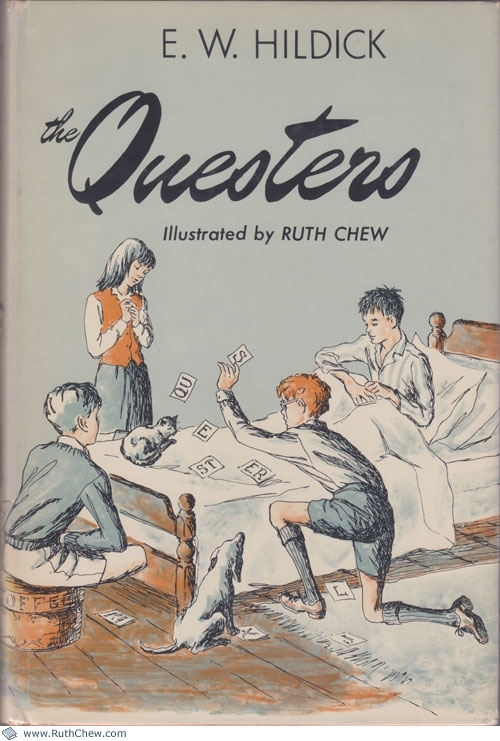 Written by E. W. Hildick and illustrated by Ruth Chew. First published in 1970 by Hawthorn. Ages 9 and up; Grades 4 and up. 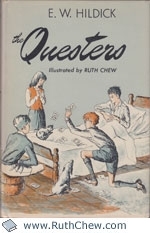 Peter, who is bedridden, has a telephone and a remote-control television unit on his bedside table—and if the Questers’ Master Plan works, he’ll have a walkie-talkie set that will keep him in touch with his friends’ activities. Andy and Julius are the full members of the Questers, and Peter’s sisters, Eve and Ruth, are associate and probationary members. By combining forces they hope to win the talent contest, the pet show, the ice-cream eating contest, and the all-important treasure hunt. Peter’s role in the Astonbury Park Holiday Play Scheme is strategy: "You’re the brainy one, aren’t you? You’re always saying how lying in bed all day has sharpened your wits." Peter comes up with ingenious solutions to the various problems; Andy and Julius provide the willing (if sometimes misguided) legwork; and Eve and Ruth do their best to assist. But the best-laid Master Plans sometimes misfire, and the way this one goes wrong leads from one hilarious scene to another. Bedridden Peter and his friends work out a master plan to win several contests.